Internal audit jobs are traditionally considered unpleasant work — business units see them as annoying cops, and management sees them as necessary evil. In many organizations now, internal auditors are seen less, or not at all, as ‘policemen,’ but as advisers, strategic partners and consultants… Management now looks to leverage internal audit as a strategic resource, recognizing that internal auditors’ broad and deep perspective of operations, risks and potential opportunities can help inform business decision-making. Also, as internal auditors’ roles expand, the functions are now more specialized. Examples include IT audit, cyber-security and fraud investigation specialists. Many external auditors consider IA because of better hours and less stress. But there are more benefits than that. For those who are interested in management consulting, internal auditor is a job cut out for you. I know — it isn’t as prestigious, and you’re only working in one company. However, imagine how much deeper you can get because you are able to access internal (non-public) statistics that no other management consultants can ever dream of. If you work in multi-national companies, you can run analysis on different regional companies or by different business units. IA can be a great, fun way to have a unique look into the business and the diverse challenges facing companies. Internal audit is also a valuable opportunity for senior professionals, who look to build their business acumen in preparation for higher-level posts. Many internal auditors didn’t start in IA after graduation. They are typically experienced professions in different areas: external audit, business units, IT, operations, etc. This is a great place for those who grow tired of their existing jobs, and prefer to switch to a new challenging position that could at least make use of what they have learned in the past. Internal audit is a natural place to go to. For IT and operational professionals who want to get into accounting and auditing, internal audit is one of the best entry points. Corporations, big and small, face an increasingly complicated regulatory environment. Any professionals that deal with risk and compliance and high in demand for years to come. 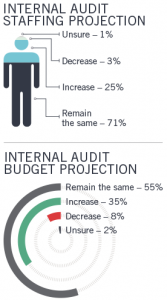 According to Pulse of the Internal Audit 2016 published by IIA, 25% of CAEs surveyed project an increase in terms of internal audit staffing, and 35% increase in terms of budget. There are certainly limitations when it comes to internal audit jobs. First of all, being an internal auditor simply isn’t as cool as an investment banker, for example. This is especially the case in some less-progressive companies, where internal auditors are still not as respected within the company. The management, or the CAE, needs to set the tone to highlight the value of internal auditors. As the role of internal auditors expand, the level of skills and experience required to perform the job increases. In order to attract talents, companies should pay for better salary and benefit packages. Not a lot of companies realize this, leading to a shortage of internal auditors. Although work-life balance is much better than external audit, there are times when IAs need to work long hours. There could also be extensive traveling if the company has regional offices across the country, or around the world even. This itself could be exciting and attractive, but for those with family and dependents, this is an important factor to consider. In a way, it is similar to public accounting — both hard and soft skills are important. Soft skills are equally if not more essential. Unlike external audit where projects and clients come and go, you work with business units and management on a long-term basis. A successful internal auditor who maintains good audit committee relationship, able to suggest ways to increase efficiency and reduce costs, provides immense value-add to the organization. CIA vs CISA: Which is a Better Certification for Your Career? How to be a start internal auditor? Well what I would like to hear more advise on is how do you switch from Accounting/Finance position to an internal auditing position. If you do not have the education and expierence background of an internal auditor, why would people hire someone like this? However the person have a Bachelor degree and expierence in Acounting/Finance plus the skills. But what’s next? How do they get there? That’s a good question, and the perfect follow up to this article. Let me give it some thoughts first. Thanks! I was thinking about the CIA exam. Is the 4 year requirement inclusive of experience? or is it that a candidate has four years to pass the exams and then can work on the internal audit experience? Hi Delia, not inclusive (thankfully), can accumulate after the exam. Thanks! Please send me details on how I can begin studying with you. Having a Master’s in Business Adminstration, would there be any reason why I would not be looked at as a potential candidate for Internal Auditor? I have some compliance experience but not accounting. In my opinion, one can always be a potential candidate, but MBA isn’t necessarily relevant to core internal audit. It is useful, of course, but if your competition is against someone with audit experience, it is tougher. Having said that, it’s great if you have compliance experience. If you are really interested, it would be helpful to learn basic accounting. which has about $500 millions in revenues,so audit staff it very small. Also seem you hjave engineeering education (which is good for Thetford position ) and are somewhat new with Dutch unit . Lkely reporting to audit leader in Michigan . were certiified as either CIA or CA or CPA . and later was lead operational auditor for Exxon-Mobil ( then just MOBIL ) . Once i earned CIA certification landed a senior audit managment position with a small Fortune 500 firms with 10,000 employees and strong financial controls but weaker operational controls. On an annual basis my small top gun internal Audit unit saved more money than it ‘s budget so was a profit centers and that seems to be the best path for creditability for you. You need skills to audit everthing not just financial statements– operations, computer systems, construction, etc. Thetford’s Norcold RV products require sales literature with photos and graphic arts expenses could be very high–a great audit opporttunity to save money. The 2016 $36 million legal setllement , telles me that Thetford’s Manufacting Quality Control and /or change order document controls units was never effectively audited before 2016.. Scrap and waste need audit too. You also need to be Certified to secure creditability with those professionals you audit and senior management. CIA is excellent and more appropriate for Thetforsd than other cerfifications.